Little known zoological history triva. Until Jim Alexander mentioned touring the Frankfurt Zoo and seeing the Grzimekhaus/Nocturnal House, and also „the cage where Marcan once performed“, I had completely forgotten about the piece of ugliness that occurred a couple of years ago, involving the Frankfort Zoo and a certain Yugoslavian/Croation Animal Trainer, who shall remain anonymous, unless I slip up before I relate the tale. The photo above, is a picture of the ape house at Frankfurt which has a replica of Prof. Dr. Grzimek’s zebra striped Dornier 27 mounted on the roof as a memorial to Grizmek. It seems this certain Yugoslavian/Croation Animal Trainer, was hammering and pestering Frankfurt round the clock for weeks, insisting that they install a memorial honoring him on the roof of the feline house, similar to the one for Prof. Dr. Grzimek on the ape house. He even had the audacity to send a picture to Frankfurt of what he expected his rooftop memorial to look like, see photo below. Finally out of desperation Frankfurt changed their phone number as well as their email address, and the anonymous Yugoslavian/Croation Animal Trainer hasn’t been heard from since. That’s the facts as they were relayed to me by Frankfurt staff. I am not passing judgment, just relaying what I have learned. Before you start deluging Frankfurt with emails telling them how unfair and ungrateful they are, you need to consider the gesture they have made. Frankfurt has agreed to use an existing mural, pictured above, in the feline house as a fitting memorial to the certain Yugoslavian/Croation Animal Trainer mentioned, who will still remain anonymous because, in addition to breeding the worlds first tabby tigers, he is also my friend. Frankfurt now refers to the rendering of a tree behind the tiger on the feline house mural as the „Ekeitment Stump,“ in recognition of this anonymous individual, who caused them no small amount of grief, in his insistence at having a memorial befitting him, installed on the roof of the feline house. 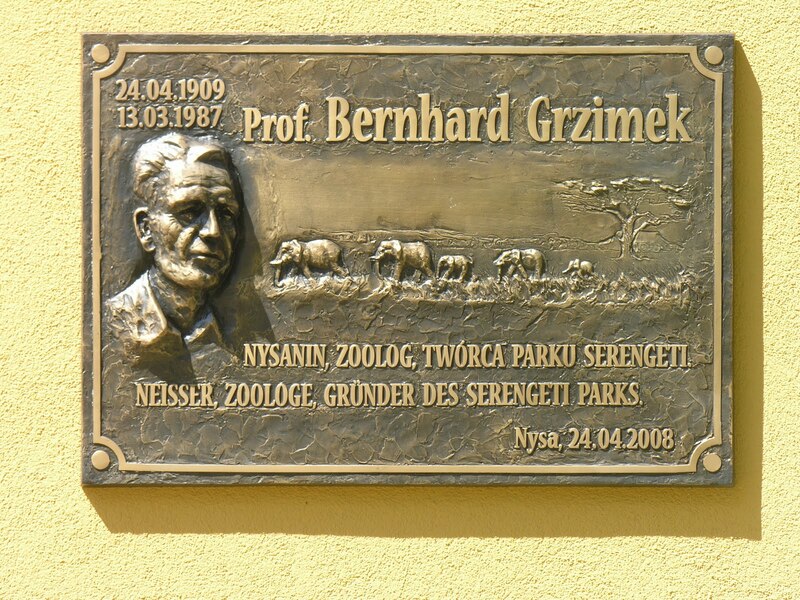 In my humble opinion, I have always consider Prof. Dr. Bernhard Klemens Maria Hoffbauer Pius Grzimek to be, if not the greatest zoo director who has ever lived, at least a front runner in Zoological History’s Top Ten. I have referenced the „Grzimek Era“ many times on this blog because, again in my humble opinion, he was that influential to the zoological profession. Some of his greatest and most brilliant work was done in the Conservation field in the Serengeti, dealing with the greatest tragedy any man can face, the loss of his son while following his dream. Other folks must also have the same opinion of Prof. Dr. Grzimek. At the bottom of this page is the plaque from the memorial to him in his birth town of Nysa, Silesia. Directly below is the Grzimekhaus, the nocturnal building opened at the Frankfurt Zoo in 1978. But even more remarkable is the postage stamp, at the top of this thread, issued by the German postal system in 2008 to commemorate the year Prof. Dr. Grzimek would have been 100 years old, if his homeland and mankind had been fortunate enough that he had lived that long, and not died in 1987. That folks, is about the „best, high dollar, top of the line, it doesn’t get better then that“ paper that any man can be blessed to have hung in his honor. After studying Biological Sciences in 1928, first at Leipzig and later in Berlin, he received a doctorate in 1933 in Zoology at Biology faculty. He married Hildegard Prüfer May 17, 1930 and had 3 sons: Rochus, Michael, and an adopted son, Thomas. During World War 2 he was a veterinarian in the Wehrmacht and worked for the Reichsernährungsministerium (Food Ministry of the 3rd Empire) in Berlin. In early 1945, the Gestapo raided Grzimek’s Berlin apartment, because he repeatedly had supplied food to hidden Jews. Grzimek then fled from Berlin to Frankfurt, which was occupied by the U.S. Army. In April 1945 he was appointed police chief of Frankfurt by U.S. authorities, but he refused the job. 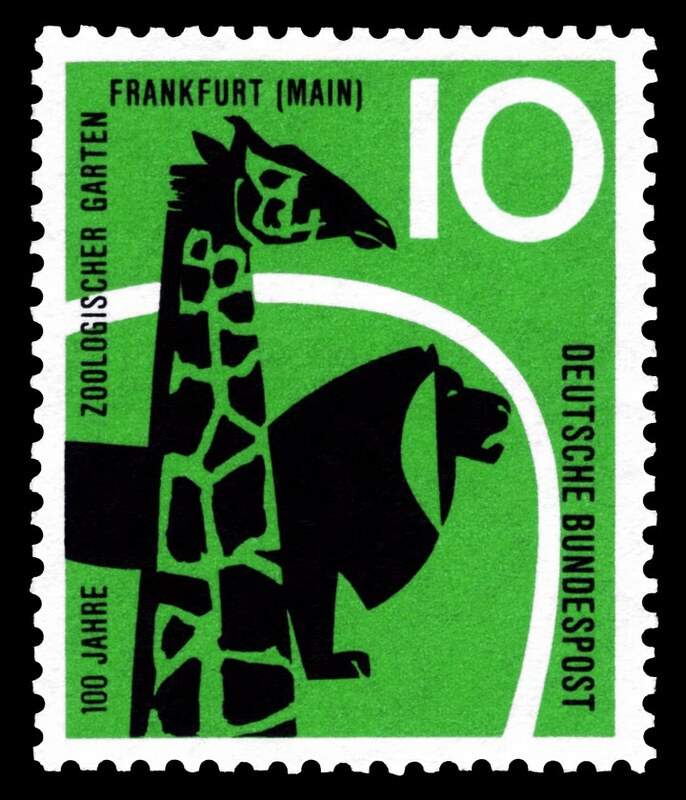 After World War II he became director of the Frankfurt Zoological Garden on 1 May 1945. The zoo then in ruins and all animals killed, except 20, he prevented the permanent closure of the Frankfurt Zoo and the relocation of the „Center Zoo“ to the suburbs, which he made into one of the largest zoological gardens in Germany. On 1 July 1945 the Zoo reopened after all bomb craters were removed and buildings were restored temporarily. With festivals, dances and actors, Grzimek lured the Frankfurt population in the zoo and received the assent of the Provisional Government and the U.S. military to obtain the Frankfurt Zoo. At the same time he served as president of the Frankfurt zoological society for over forty years. The society – organized on similar principles as its London and New York counterparts – runs a number of wildlife conservation projects both in Germany and overseas; most well-known is its ongoing work in the Serengeti ecosystem in Tanzania, East Africa. In 1954 he founded the image agency Okapia, specialized in animals and nature. Today, the agency specializes in science and gives 650 photographers a job. The firm is led by Christian Bernhard Grzimek, the son of his son who died in the Serengeti. In 1975 he co-founded the League for the environment and nature conservation (BUND) and bought ten acres of forest areas and wetlands in the Steiger forest near Michelau im Steigerwald which he left to itself. Grzimek is most famous for the work he undertook for the conservation of the Serengeti. He spent several years studying the wildlife there along with his son Michael, especially on areal observation and counts of large scale annual migrations. In 1959 Michael was killed in an air crash while flying the Dornier Do 27 due to a collision with a Griffon Vulture. He wrote a best-selling book called Serengeti shall not die, which appealed enormously to the public and was key in driving the creation of the Serengeti National Park. Large cities continue to proliferate. In the coming decades and centuries, men will not travel to view marvels of engineering, but they will leave the dusty towns in order to behold the last places on earth where God’s creatures are peacefully living. Countries which have preserved such places will be envied by other nations and visited by streams of tourists. There is a difference between wild animals living a natural life and famous buildings. Palaces can be rebuilt if they are destroyed in wartime, but once the wild animals of the Serengeti are exterminated no power on earth can bring them back. The documentary based on the film won the Academy Award for Documentary Feature in 1959. He was the editor-in-chief of (and author of a number of articles in) a massive and monumental encyclopedia of animal life. After publication in Germany in 1968, Grzimek’s Animal Life Encyclopedia was translated into English and published in 1975 in 13 volumes (covering lower life forms, insects and other invertebrates, fish, amphibia, reptiles, birds and mammals) plus three additional volumes on Ecology, Ethology and Evolution. The 1975 work was issued in both hardback and less expensive paperback editions and became a standard reference work. After Grzimek’s death, the volumes on mammals were revised, and republished in both German and then in English. In 2004, the entire encyclopedia was revised and published in a new and expanded edition. All the versions of the encyclopedia are marked by clear and forceful prose, extensive use of illustrations (both drawings and color plates), and a deep love and concern for animal conservation. Of national importance were his work as co-editor (together with Austrian Nobel-prize winner Konrad Lorenz of the then largest popular magazine on animals and wildlife in German language, Das Tier (German language, i.e. „The Animal“) and of a very popular television series on wildlife. He also authored a large number of popular books based on his countless experiences with animals which he raised since his student days, managed as zoo director, and encountered in the wild during many research trips. I want to thank my friend Josip for these wonderful bit’s of Frankfurt history. 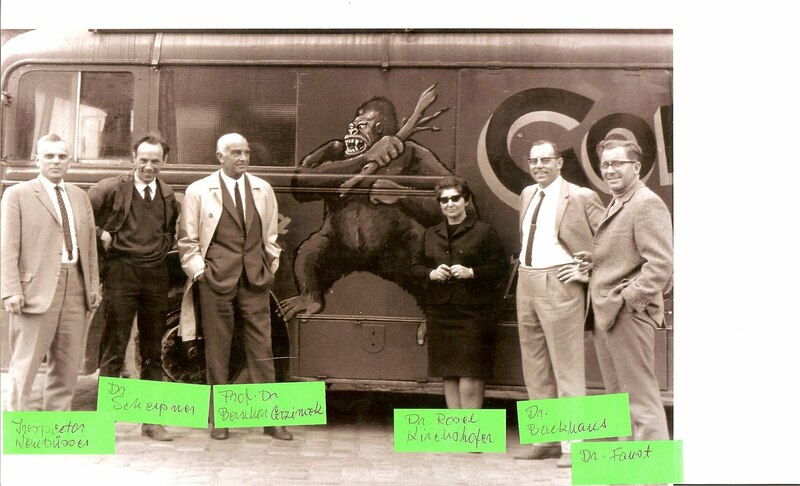 The photo of Prof. Dr. Grzimek and staff is priceless to me, especially the pre political correct „vintage zoo advertising“ of a roaring, log wielding Gargantua/King Kong coming hard with death and destruction, as well as another look at Josip in his „bare chested Charles Atlas“ day’s. 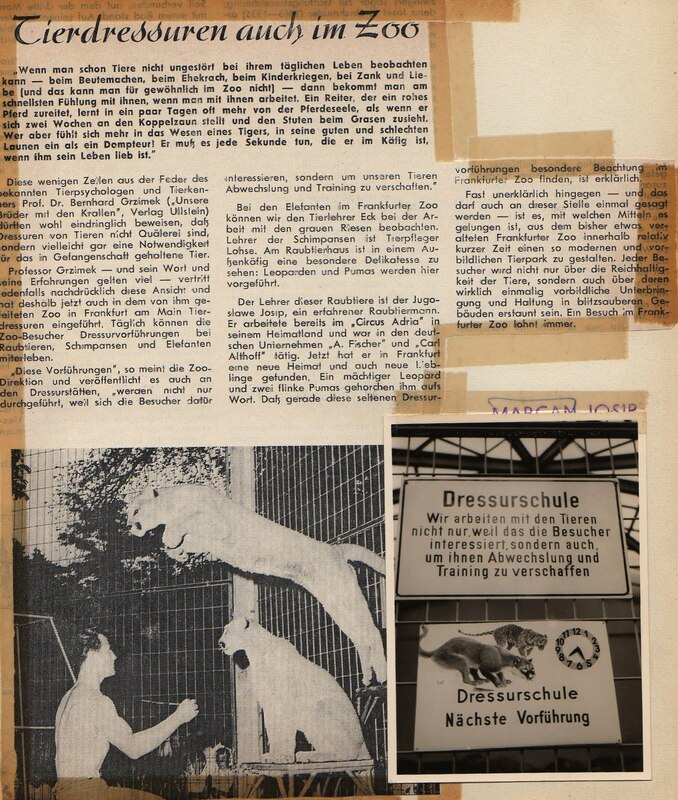 If you can read German, you will note in the newpaper article that Prof. Dr. Grzimek endorsed the training of animals for their physical and mental well being in captivity. Actually, the great man, Bernard Grzimek died on March 13, 1987 falling asleep while watching a circus performance with some children. I remember it today, because Charly Baumann told me the next day after, when he received the news from Germany. If Marco Kirsten(you should be able to double click it) or another „cabbage head“ has a moment, I would appreciate a translation of the above newpaper article. I use the term „cabbage head“ with tongue in cheek and with respect. It is a term that I learned years ago from a well known circus animal act producer from Illinois who will remain anonymous(if you have been dead for the last 100 years), unless I slip up and reveal him. When this anonymous person would get „miffed/perturbed/upset“ at his wonderful German wife for something, this anonymous person would call her a “ stubborn cabbage head,“ and she would have to quietly and patiently remind him that „don’t you mean kraut head, John?“ To which this anonymous person would reply, „yes Herta dear, but you knew who I was talking to anyway, so it’s not important.“ LOL God, the wonder memories we aquire in a life time. 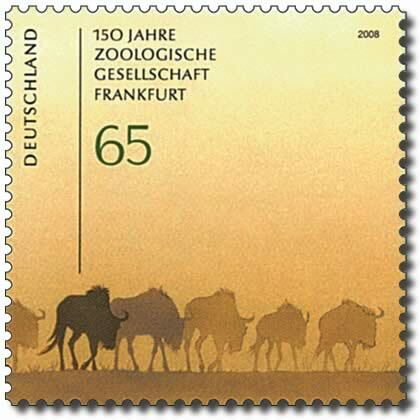 The German postal system has issued two stamp’s honoring the Frankfurt Zoo. The stamp above was issued in 1958 commemorating the zoo’s 100th Anniversary and the stamp below, was issued in 2008 commemorating the zoo’s 150th Anniversary. As many of you know, who have been following the blog since it’s inception, collecting „zoo“ stamps has been a passion of mine since I was about 10 years old. Stamp collecting is an incredible hobby that I tried, to no avail, to interest my children in. What with video games, Transformers, and Star Wars, stamp collecting was up against some tough competition. No way could I convince them that looking for, and saving „pretty little bits of paper“ was more exciting then flying an imaginary space ship around the universe blasting monsters from the planet Neutron. The hobby of Philately, or stamp collecting and study is, like so many wonderful thing’s, almost a „dinosaur“ and relic of the past, with a very small number of companies or stamp stores around any more. The few remaining ones function online. What a wonderful, personal thing stamp collecting it used to be before the internet. If you wrote to a stamp company with your collecting interests they would send you a number of stamp’s „on approval“ with their asking price. What „on approval“ meant was, within two weeks you choose which stamps you needed, and sent the rest back along with payment for them, with any coin taped to a recipe card. They would always put additional stamps, normally with your collecting interest on the envelope with your „approvals“ so you could soak them off of the envelope, and add them to your collection as a „bonus“. Can you imagine any business today, in this world of „do you have identification“ sending you their product free of charge plus a free „bonus“, for you to look at the product and hoping you would return it if you didn’t like it??? The amazing hours spent in the basement of famous stores like Macy’s and Gimbel’s where most of their stamp departments were relegated by the 1980’s, searching through a multitude of stock books, looking for THE stamp to complete a set, is rivaled only by finding a dusty zoo lithograph or out of print animal book in an antiquarian book shop. Or the small private mom and pop stamp stores which had stood for over 50 years in the same location, where you could „negotiate“ what you were willing to pay for the stamps. Some folks would exclude the tax, and some would offer 30% off if you bought $30 worth, and some of them were so tough and bull headed they would let you walk out the door if you offered them 4 cent’s for a stamp they were asking a nickle for. LOL If you want to accuse me of sounding like my Grandpa McMaster or Grandpa Burck, who used to tell me „they don’t make it like they used to“ fine, because that’s an accusation I’ll gladly accept, because this is just one more example of how the „modern world“ has tanked, and why history is the most valuable asset mankind will ever have, if we use it as a learning tool to stop us from being ignorant and mucking it up any more then it is today. Aerial view of Frankfurt Zoo in 2006. If that is the original zoo tower from the 1878 photo below, then when the 1878 picture was taken the photographer would have been standing in just about what is now the sea lion pool, shooting across, and the tower is on the wrong side of the river. Does any one know if that is the River Main running through the zoo, and was it rerouted after the war? The modern growth of tree’s, which I am assuming may include some Sycamores with lumens, which we see today along the water, would have made the 1878 shot difficult, if not impossible. I have often pondered that the Frankfurt Zoo’s Exotarium „tower“ looked an awful lot like the zoo tower pictured in the post below in 1878. I am still not sure it is the remnant’s of the original or if it is a new one. Does anybody know if it is or isn’t? Remarkable if it is, and well worth the trip to the Frankfurt Zoo just to gaze upon it’s history. In my humble opinion, a truly remarkable architect is the one who can „redesign“ old structures, to make them suitable for animal husbandry today, instead of razing them, and designing a „crystal cathedral“ in their place. Both of these pictures are from 1878. The picture above is of the „camel house“ and yard, and the picture below is of the aquarium and zoo tower. 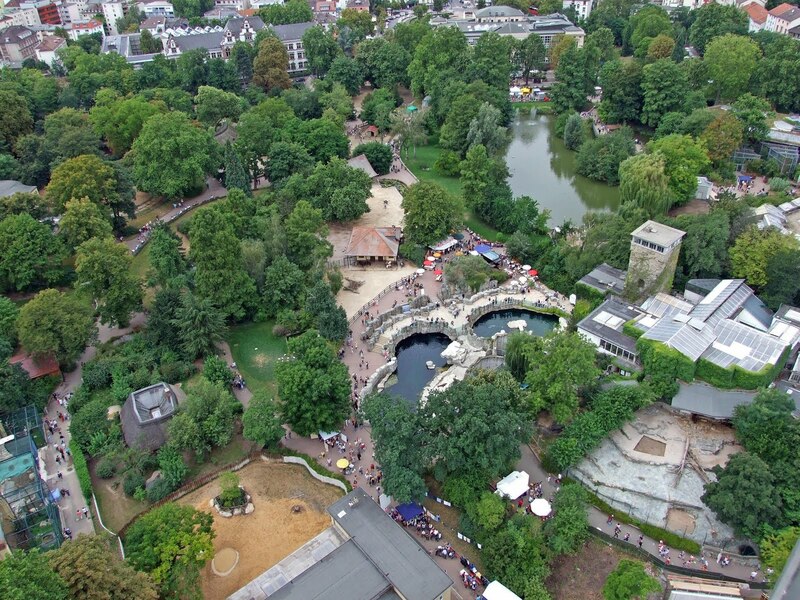 The Zoo of Frankfurt am Main was created in 1858, and is the second oldest zoo in Germany, after the Berlin Zoo. It was founded through a private initiative, funded since 1915 by public funds. During the Second World War it was almost totally destroyed, with only 20 animals surviving a bombardment in 1944. Most of the building’s at the zoo today are the result of the „frantic“ early fifties when the zoo was rebuilt. List of events above from 1891, and below, the dining room in the Zoo Society building in 1878. Type Frankfurt Zoo in the search bar, at the top left for more on the Frankfurt Zoo. Ah Jim, come on. We’re pals. How could my quest for education, learning, and enlightenment be misconstrued as „jerking the chain?“ I received the above rendering of WDI’s proposed new elephant facility/exhibit, called Mountain Top Elephant Trek, and was going to blame Walt. Thank’s to your insight thing’s aren’t all his fault, as I assumed. Besides there not being enough usable surface area around the elephants new house, leaving basically just a small yard like exhibts of old, that guest „dissatisfier“ you mentioned. only in reverse, long lines for a long, long trip is going to have to be considered. By the time the guests(interesting, because the circus called them suckers) trek all the way up Ganesh Mountain just to look at the elephants standing in a little yard in front of the house, they are not going to be real pleased. I should think this design would be more suited for a flume ride or something similar. In fact, flume ride is the perfect educational „hook“, or justification/alibi when you need to patch why there isn’t going to be a Mountain Top Elephant Trek to Ganesh enlightenment anymore, when the „dissatisfier hits the fan.“ A flume ride uses water for locomotion just as elephants also use water for bathing, so we felt a flume ride would better educate the „guests“ on the plight of elephants in the wild, what with flume rides being so wild and all. I’m a natural born Education Curator, huh Jimmy? When Galileo died one day, his body parts were reportedly separated. Some of these „souvenirs“ were now presented by an institution in Florence. Probably the most famous anecdote is only an invention: „Eppur Si Muove“ Galileo Galilei is said to have muttered as he left the Basilica of Santa Maria sopra Minerva in Rome in June 1633: And the earth, yet it moves. But even during his lifetime circulated the sentence with which the brilliant physicist and astronomer should have defied the Roman Inquisition, which made him for his „Dialogus“ about the world systems of Ptolemy and Copernicus the process – because Galileo is the ecclesiastical doctrine of Earth rejected as center of the world. Many in the recent discovery in the Galilean research could, however, take as visible proof of the truthfulness of the famous quote. 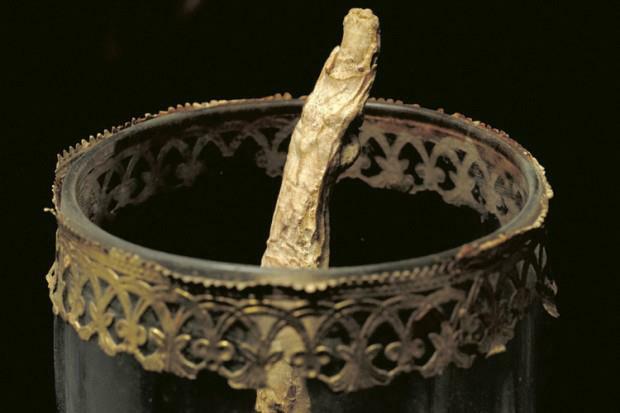 The Institute and Museum of the History of Science in Florence now presented the skeletal remains of a middle finger and a thumb of a right hand and a tooth which, says director Paolo Galluzzi, undoubtedly came from Galileo. Researchers refer to this DNA studies. The unholy relics were happened to the institution by a collector. The acquired at auction a Galilean bust including wooden box with the words „relics of the 17th century“. In it were the body parts that should have been in 1737 separated from the remains of the astronomer, when they were solemnly interred in Florence in the Santa Croce church. After Galileo had passed away in 1642, the church had still been able to prevent his burial in a magnificent tomb, which the Medici had erected it. That it happens to be the middle finger, which was separated as a souvenir because, lets think about the infamous gesture of stinky finger. With the well-known since ancient times phallic symbol, cited public appeal in the present by Johnny Cash or Stefan Effenberg, Galileo may well have underscored his sentence: And yet it moves. Als Galileo Galilei dereinst starb, sollen ihm Körperteile abgetrennt worden sein. Einige dieser „Andenken“ wurden jetzt von einem Institut in Florenz präsentiert. Wahrscheinlich ist die berühmte Anekdote nur eine Erfindung: „Eppur si muove“, soll Galileo Galilei gemurmelt haben, als er im Juni 1633 die Basilika Santa Maria sopra Minerva in Rom verließ: Und die Erde, sie bewegt sich doch. Aber schon zu seinen Lebzeiten kursierte der Satz, mit dem der geniale Physiker und Astronom der römischen Inquisition getrotzt haben soll, die ihm wegen seines „Dialogus“ über die Weltsysteme des Ptolemäus und des Kopernikus den Prozess machte – weil Galilei darin die kirchliche Lehre von der Erde als Zentrum der Welt verwarf. Manch einer könnte die jüngste Entdeckung in der Galilei-Forschung allerdings als sichtbaren Beweis für die Wahrhaftigkeit des berühmten Zitats nehmen. 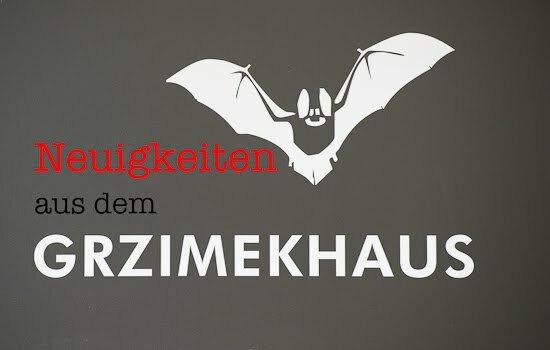 Das Institut und Museum für Wissenschaftsgeschichte in Florenz präsentierte jetzt die skelettierten Überreste eines Mittelfingers und eines Daumens von einer rechten Hand sowie einen Zahn, die, sagt Direktor Paolo Galluzzi, zweifellos von Galilei stammten. Die Forscher verweisen dabei auf DNA-Untersuchungen. Die unheiligen Reliquien wurden dem Institut von einem Sammler zugetragen. Der hatte auf einer Auktion eine Galilei-Büste samt Holzkiste mit der Aufschrift „Relikte aus dem 17. Jahrhundert“ erworben. Darin fanden sich die Körperteile, die 1737 von den sterblichen Überresten des Astronomen abgetrennt worden sein sollen, als diese in der Kirche Santa Croce in Florenz feierlich beerdigt wurden. Nachdem Galilei 1642 verstorben war, hatte die Kirche seine Bestattung in einem prunkvollen Grabmal, das die Medici ihm errichtet hatten, noch zu verhindern gewusst. Dass es ausgerechnet der Mittelfinger ist, der da als Andenken abgetrennt wurde, lässt an die berühmt-berüchtigte Geste des Stinkefingers denken. Mit dem schon in der Antike bekannten phallischen Symbol, durch Johnny Cash oder Stefan Effenberg in der Gegenwart publikumswirksam zitiert, könnte Galilei durchaus seinen Satz unterstrichen haben: Und sie bewegt sich doch. what can write here ?? ?